There is a bewildering number of shoemakers in Japan, somewhere between 35 and 40 depending on how you count. Although many have people working for them, they are all essentially sole operators. One person founded the house, is in charge, and there is little thought to building a bigger operation with potential succession. Within Japanese culture, this seems perfectly natural. Masters in most crafts are sole operators, working purely for themselves and their reputation. They even take a slightly dim view of apprentices - as we saw in the piece on Sasuke last week. The set up has both advantages and disadvantages for the customer. On the plus side, you deal directly with the maker and get consistent quality and design. The shoes are also relatively cheap. Given many work at home, by far the biggest cost is their own labour, and they’re trying to do little more than make a living. On the negative side, waiting times are long. Eighteen months is not uncommon. Smaller operations always find it harder to deal with fluctuations in demand, and it’s a particular problem when you’re doing everything in-house. With many bespoke customers, this means a maker’s availability can be as big a factor as how much they like the shoes. “I don’t think it’s that much of a problem though: customers are willing to try lots of people, and to wait,” commented Yuki Shirahama when we met him in Tokyo last month. Yuki was one of three makers we met in Tokyo, along with Yohei Fukuda and Shoji Kawaguchi - picked largely based on recommendations rather than anything systematic. We have written about Hidetaka Fukaya (‘Il Micio’) before of course, based in Florence, and we did want to see Koji Suzuki's workshop but he wasn’t in Japan at the time. 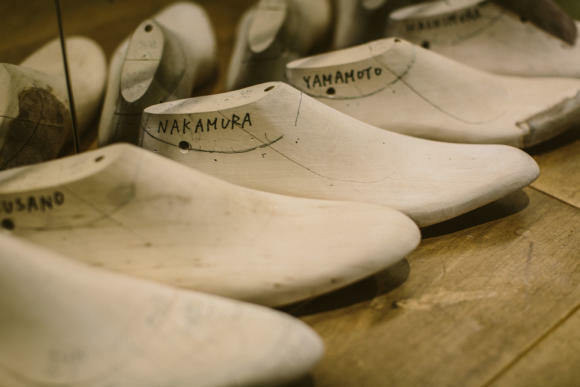 Yohei is one of the bigger, best-established names in Japanese shoemaking. He also has a rather interesting set of products. 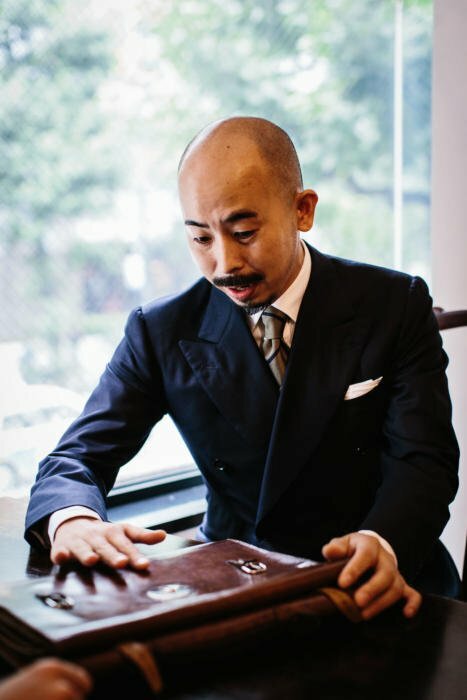 This enables Yohei both to reach a broader range of customers, and to cater to people that are travelling to Japan just once, or that he meets in Hong Kong once (he visits The Armoury twice a year). Those that try him at any level get to experience a fineness of finishing that puts most English and Italian makers to shame - but is becoming increasingly familiar to those in Japan. 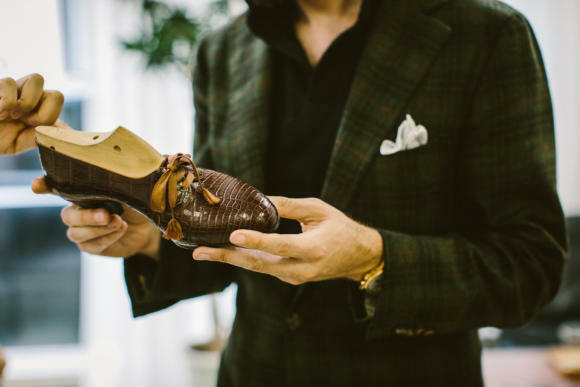 There is the delicately bevelled waist, of course, but more noticeable is the shape around the heel - its pitch forward, its segue into the heel cup of the shoe, and its narrowing on the bottom to perfectly line up with that shaped waist. Yohei trained in the UK, going first to Brighton for a year to learn English (a big advantage over other makers) and then to the Tresham Institute in Wellingborough for a one-year course, which became two years when three of the students carried on. He then went to work at some of the Northampton factories, including Edward Green, but wanted to focus on bespoke. So Tony Gaziano introduced him to a maker, Ian Wood. Another maker easily ready to compete with the rest of the world is Shoji Kawaguchi, who goes under the brand Marquess. Shoji is easily the most smiley person I have ever met. He never stops. Occasionally there will be a serious moment when he discusses arch height or welt width, but basically he smiles all the time. Shoji also studied at the Tresham Institute (the course has since closed) and met his wife there. In fact, he says 80% of the people on the course at the time were Japanese. From there he moved to Newcastle to work with Paul Wilson, doing work for both Cleverley and John Lobb Paris. Later he worked for Foster’s in London, while he his wife worked for Cleverley. It was Tony Gaziano that really inspired Shoji, however, and whom he still refers to as “my hero”. He worked for him when Tony was at Edward Green, and continued to do so after he moved back to Japan. “If it wasn’t for Tony, I never would have been brave enough to set up my own company. I just wouldn’t have thought it would be possible,” he says. 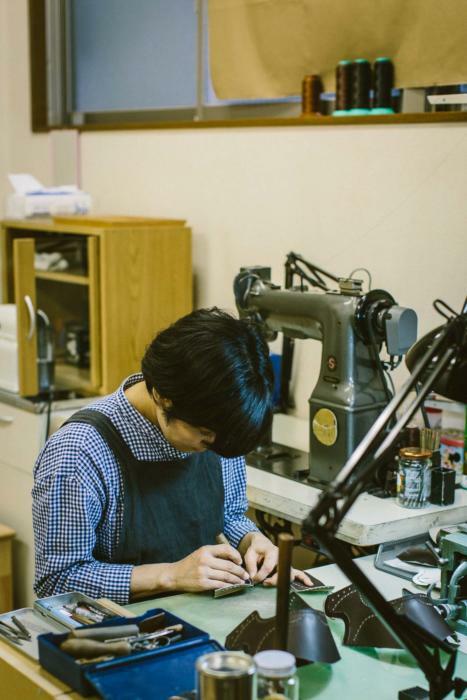 Shoji’s workshop today comprises five people, including two outworkers that work solely for him. 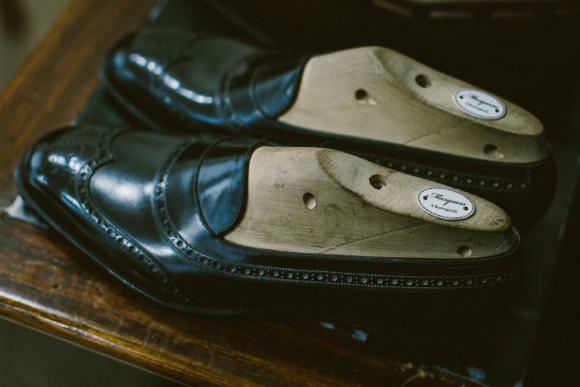 The place is scattered with vintage English shoes - the collection of which is particular passion of his. The style is very English. Similar to Yohei in line, but more conservative in design. A nice example is the two black wing-tips pictured above. Shoji has focused on making the top, city shoe just a little finer in every respect than the more chunky, bottom shoe. So not just a thinner welt and slimmer waist, but a thinner sole, an imitation brogue on the wing, a denser brogue pattern, closer stitching, flat laces rather than round, everything. This is the ‘balance’ he refers to. Marquess shoes cost ¥346k plus tax. Shoji travels within Japan and has just started visiting Hong Kong - at Attire House. 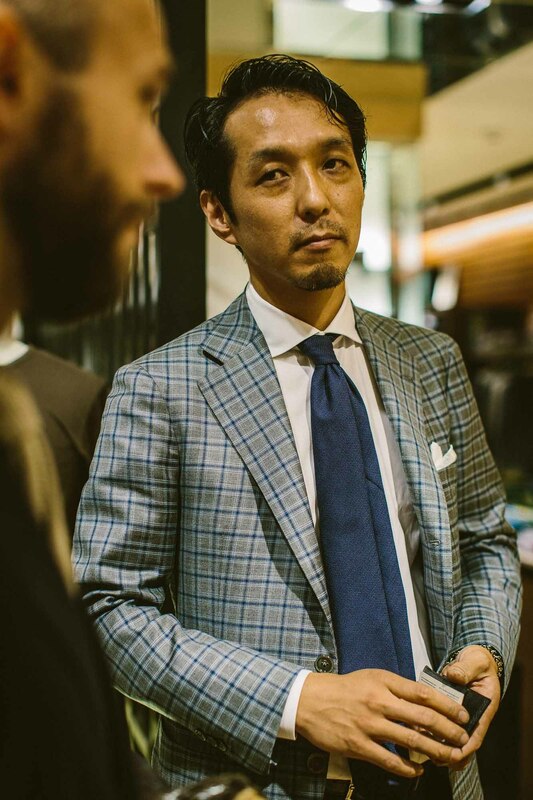 Yuki Shirahama (above) was holding a trunk show in Strasburgo when we met him - one floor down from the Tailor’s Lab where Sartoria Domenica and shirtmaker Yamagami were based. Shirahama’s style is an interesting mix. 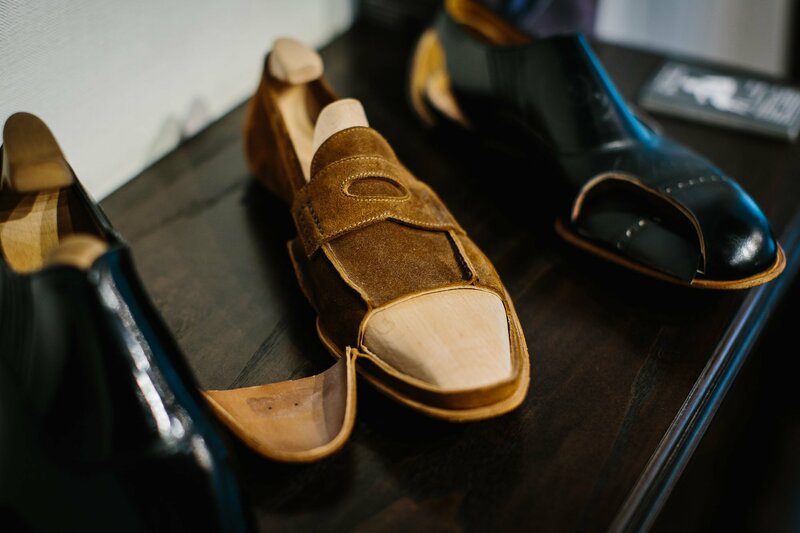 Where many of the shoemakers can be easily identified with either the English or Italian style, he deliberately tries to blend together both with his French experience (at Altan) into a range of models. So those on display included slim, formal shoes alongside Norwegian-welt walking boots, plain chocolate-brown derbys and brightly patinated brogues. Yuki lives and works in the south of Japan, in Fukuoka. 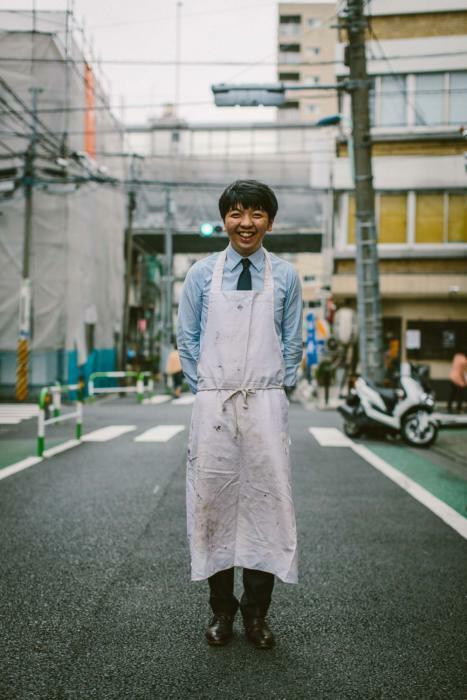 He uses the Strasburgo shops to travel around and see clients elsewhere. 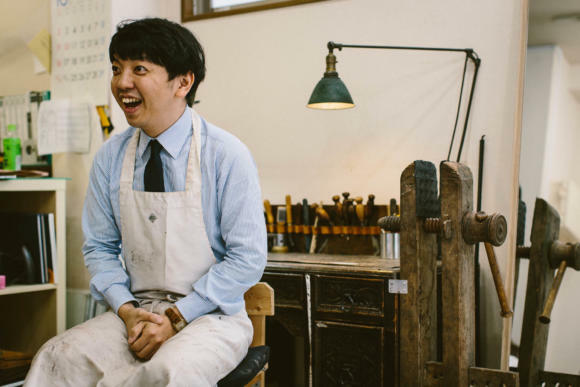 Yohei agrees, also pointing out that most shoemakers teach in their spare time, which helps to stabilise their income and spreads knowledge around. On this evidence, they will have no problems at all. I didn't take the plunge and commission a pair of shoes on this trip, as I have no plans to be back in Japan or Hong Kong. But if I did I would jump at the chance. Photography: Jamie Ferguson @jkf_man. 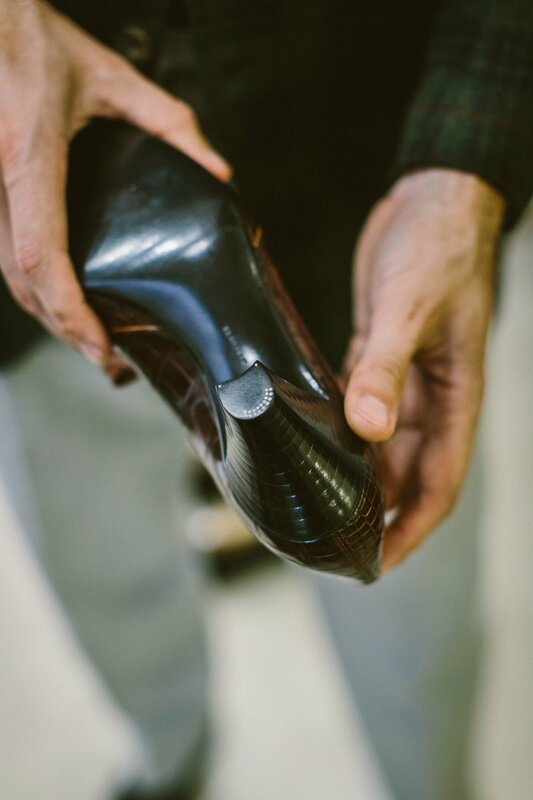 Above: a Marquess bespoke women's shoe with a beautiful hand-stacked heel. Thanks go to Masaichi Hasegawa of Gaziano and Girling and Jason Yen of Gaziano and Girling/Camps de Luca for their help with organisation and translation. You can follow the discussion on Japanese shoemakers: Yohei Fukuda, Marquess, Yuki Shirahama by entering your email address in the box below. You will then receive an email every time a new comment is added. These will also contain a link to a page where you can stop the alerts, and remove all of your related data from the site. 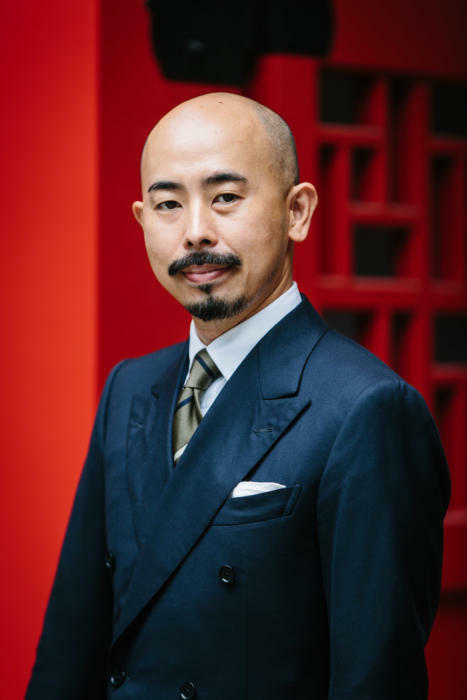 Do you know who made Yohei Fukuda’a suit? Vick Tailor (see previous post on Japanese tailors). Simon, I’m a tall (6’2″) man with very broad and very square shoulders. I also have a very S-shaped back (prominent kyphotic upper back and deep thoracic curve); my chest is strong. And so, all of my jackets, including those I’ve had made MTM, have collar roll and gaping lapels. What questions do I need to be asking my tailor to ensure the right fit? It’s very hard to deal with those 3D issues, particularly the curve of the back, with a MTM suit. 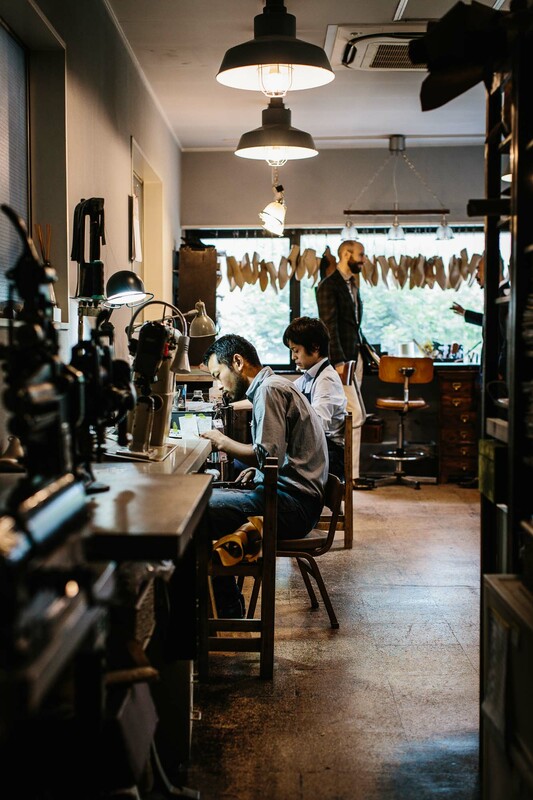 You need bespoke to deal with it really – is that what you’re suggesting by asking about what to ask your tailor? Yes, I’ve had a hard time. There was an MTM specialist at Suit Supply Chicago who was a wizard, and he made a great jacket for me. But I haven’t had as much luck recently since he’s moved on. I’d love to have a true bespoke jacket, but $1500-$1800 is about as much as I can justify for a jacket right now — not the $2500+ that I know I would need for a decent bespoke piece. That’s the problem with MTM, and the real benefit of bespoke. Once you have a bespoke pattern, you never have to worry again, but MTM staff leave every year or two. It’s worth contacting Whitcomb & Shaftesbury (look up my review of them). With the current exchange rate, you should be able to get a bespoke jacket for the top end of your range. Bearing in mind Simon’s point on the limits of MTM v. bespoke, SuitSupply Chicago’s current MTM specialist, Jonathon, is very good. He knows the system and what it can and cannot do. Nice article Simon! Fukuda and Kawaguchi are both great persons and makes wonderful shoes. Haven’t seen Yuki Shirahama’s shoes IRL, but they look nice as well when seen in pics. Thank you very much for this post! Such an introduction was still missing despite a great deal of blogs dedicated to menswear. 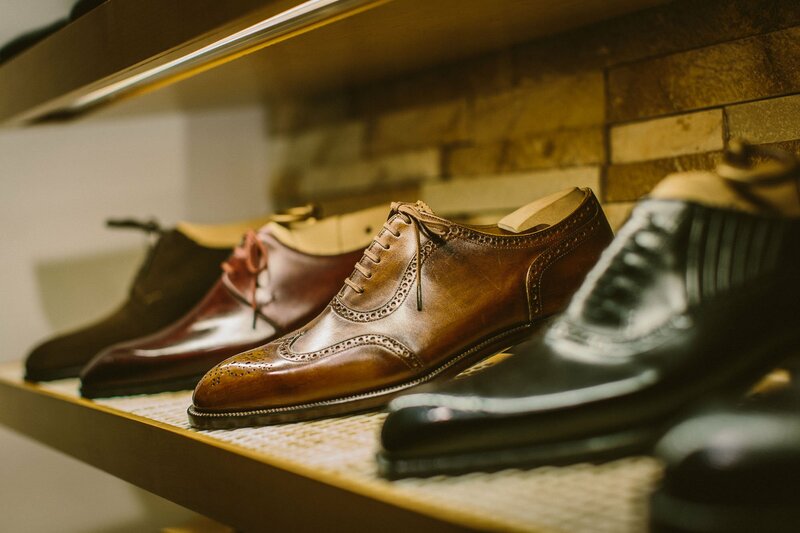 You’ve offered an opportunity to see closely what these shoemakers have been crafting. over the years. And I muss confess that I’m impressed! By the way, it’s very interesting to note the role played by Tony (G&G) within this Japanese context. A clear indication of his own dedication to this crafstmanship as such. For that we, at least PS’s readers, can’t thank him enough! Hi Simon, sorry to go ‘off topic’, but had you read that Mes Chaussettes Rouges has bought William Abraham? If true, what impact do you think this will have on the WA company? Simon, have you spoken to Fukuda, or the others, about bringing his prodcuts to Europe? I’ve always found his offerings very interesting. From a design standpoint their shoes are fantastic, leaps and bounds above any of the English makers and certaily on par with the best of Continental Europe. Unfortunately, I’ve heard very mixed things about the fit of Japanese shoes for Europeans. 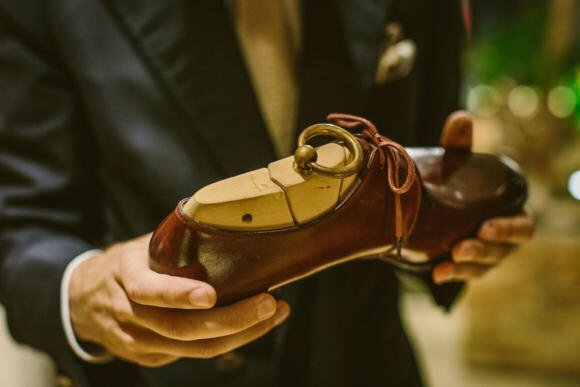 I recently got to know a Swiss gentlemen who had some shoes made in Japan after Delos sold out to Berluti and it took the makers quite some time to get the fit right. In my opinion they haven’t held up well and the patina went rather quickly. Still, their attention to detail and appreciation for the craft is really fascinating. I have heard similar things about fit, yes. But not in relation to any of these makers. Thank you for this very interesting post. Indeed, this is a very good introduction into Japanese shoemakers. I muss confess that I’m utterly impressed by the level of their craftsmanship! 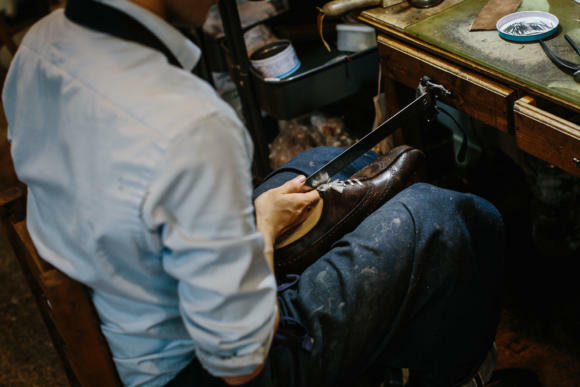 It’s also very interesting to learn that Tony (G&G) has played a role in the process that has somehow positively contributed to the emergence of this generation of shoemakers. A clear indication of his own passionate dedication to this craftsmanship! It was really worth mentionning! Now a quesrion: have you ever heard of the apparently Japanese shoemaker The Gild of Craft? Is he based in Paris or Japan? 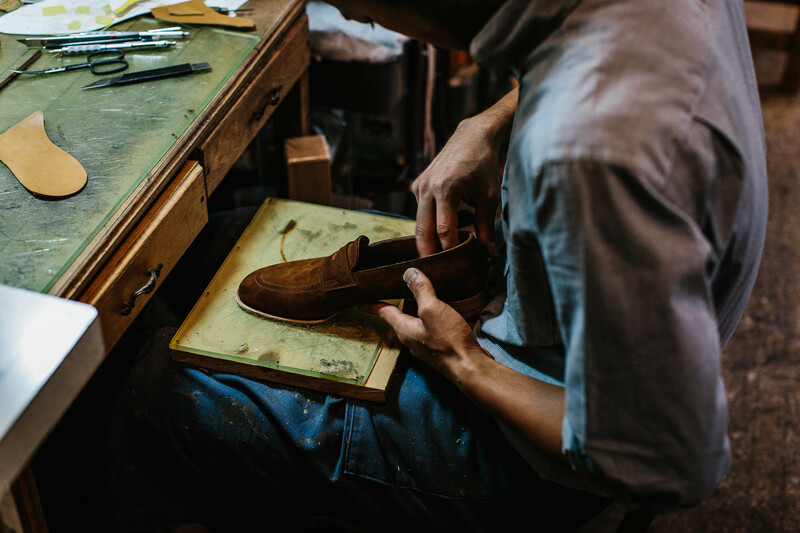 “Guild of Crafts” (Chihiro Yamaguchi) is a Japanese shoemaker offering bespoke and MTO. The company is based in Asakusa (Greater Tokyo) with shop premises in the Ginza. Hey Simon, from what you have seen, how would you compare the level of make to Gaziano and Stefano Bemer out of curiosity? On bespoke? The level of make has been similar – my Bemers were probably better than the first two G&G I had, but the latest G&G (from Daniel) is slightly better than Bemer. So it varies – I’d pick more on style than make between the two. Thanks Simon, sorry I actually meant G&G / Bemer vs. the Japanese makers rather than between the two of them (I agree with you conclusion on that but would also add that Bemer is also quite a bit cheaper, especially after you take out the one-off cost of the last making after the first order). Quality of Marquess aside, I want to have a pair made by Shoji solely for his smile…he looks extremely happy! With regard to fit I have one pair of shoes by Koji Suzuki and another pair being made. The first pair are absolutely the most comfortable shoes I have ever worn (compared to G&G, Edward Green, Saint Crispin’s, etc.) and I have long and narrow feet so quite different to the standard Asian male foot. 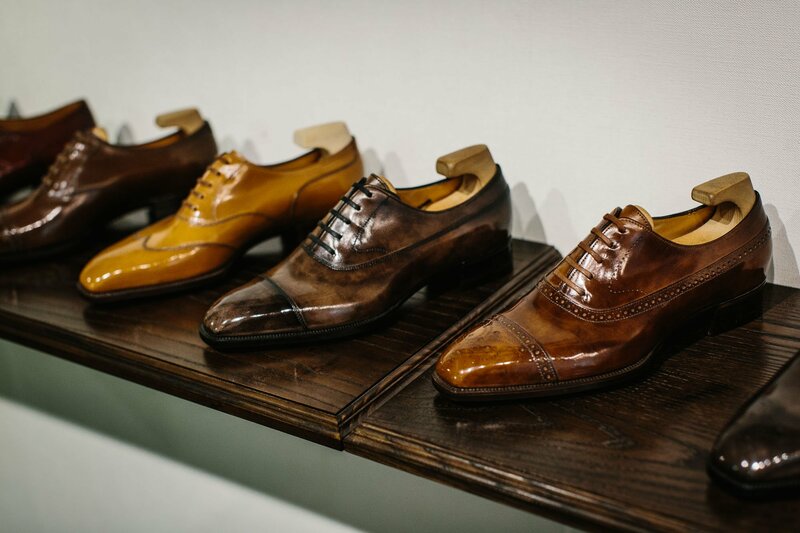 I am having some G&G bespoke made so I am intrigued as to how they will compare with Koji’s shoes in terms of comfort. Having seen a number of pairs of Fukuda-san’s shoes in The Armoury I have to say they really are beautiful as well! 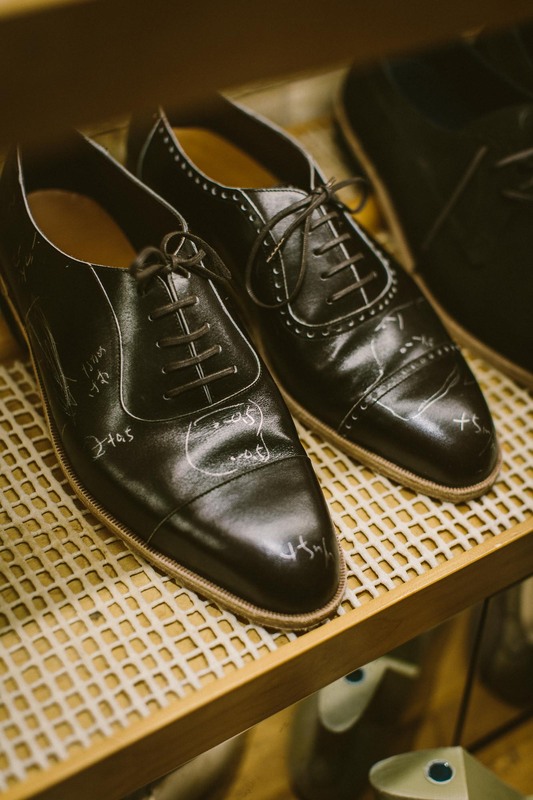 Surprised you did not mention the incredible Asian/Japanese craft of the finish or patina applied to these shoes. Did these makers talk to you about their finishing technique? Thanks for yet another informative post. 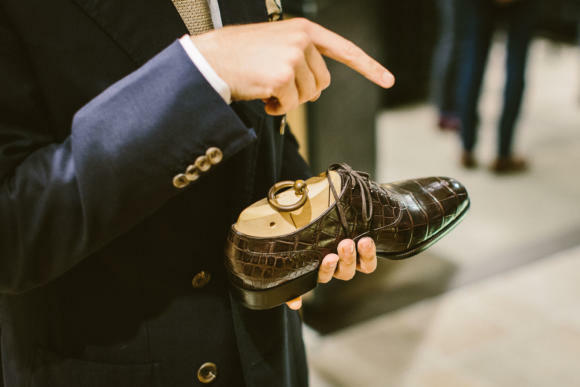 However, I have a question on your comment on pricing – you have mentioned in the article that the shoes are also relatively cheap. Did you mean this specifically in the context of a bespoke offering? The reason I ask is when I look at the price range you have given, for example, for shoes made by Yohei Fukuda it is the equivalent of a little over GBP 1,900 (Japanese Yen 280,000) for what I presume to be a “made to order pair , from a range of in-house lasts and sizes”. With taxes it will be higher (I don’t know what’s the tax on these goods in Japan) which means this is substantially higher than, say, a MTO Deco pair by G&G. 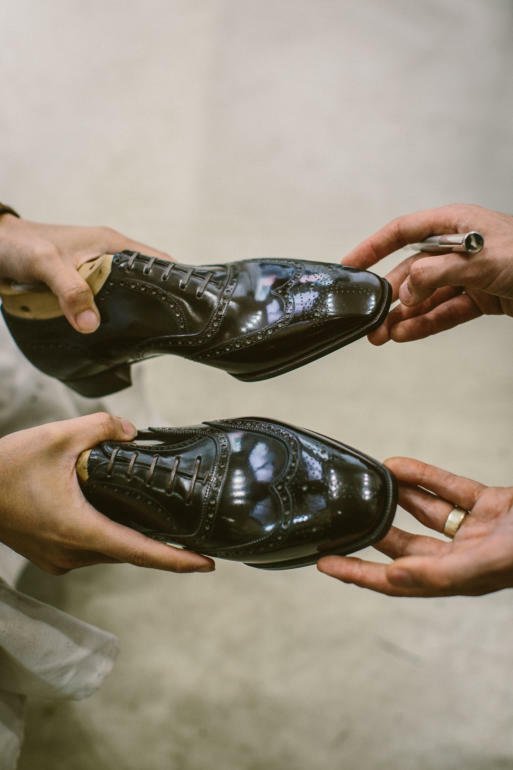 However, the price for a full bespoke offering is a just under GBP 3,000 (Japanese Yen 430,000) which I believe is lower than what a bespoke pair would cost you from some the British makers? Please correct me if I am wrong in making this assumption. First off, great and very informative post. I did not see Corno Blu (http://www.cornoblu.info) in the list. His work is very extravagant and is comparable wow factor to Fukuda. I see a lot of questions about how the Japanese makers compare to those in the UK such as G&G. Keep in mind most of, if not all, of the Japanese makers have trained in Italy or the UK. They add a certain modern flare to their creations usually with very fine stitching, last shaping, and general attention to detail. Even though their polishing and finishing is replicated by other makers, it never seems to look as impressive, but it may just be the photos. I have seen some amazingly polished G&G. Additionally, as Simon has already mentioned, their shoes are almost always entirely hand made from clicking to lasting. This is something that is rare on MTO makers outside of Japan. A few makers such as St. Crispins and Enzo Bonafe come to mind, but you will likely not find such hand work unless you go bespoke. I don’t personally feel this to be very significant. I love my MTO G&G. If they were hand lasted it would make little difference to me. The finishing is still amazing throughout. I cannot wait to get a pair of MTO Fukuda balmoral oxfords in brown museum calf with a brogued cap toe.